← 95. Make Room for What’s New! Sun rays and rising temperatures, how we do love them! In countries where there is not so much sunlight, people become excited when spring comes. People become more cheerful, more exuberant and wear bright colors. People become more active, go outside more and enjoy the warmth of the sun. You chat longer with your neighbor because it is so wonderful to be out in the sun. People look happier and their mood is more cheerful. Come on, sun’s rays! We’re waiting to catch you! Sunrays are pure nutrition for us. 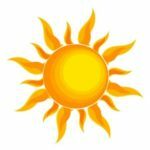 When we receive the rays of the sun on our skin, our skin makes vitamin D. If you don’t get outside much, you can have a vitamin D deficiency. This is true of people, for example, who are inside all day, such as the elderly or (too) hard-working office workers. Much is known about vitamin D. If you have a deficiency of it, it can lead to all kinds of health problems, including depression. That is because vitamin D is necessary to absorb calcium from your food. If you have a vitamin D deficiency, you body will have a deficiency in calcium, which can cause you to become depressed. You also make your parathyroid glands work harder than necessary. If you have a serious vitamin D deficiency, you can even develop diseases that cause bone deformities. Or, bone decalcification, or osteoporosis. You can monitor your own nutrition. Do you eat a lot of cheese and milk products? Then your body is craving calcium and it’s possible that you have a vitamin D deficiency. If you do the MIR-Method you indicate with step 5: ‘Supplement all shortages’, that you want to supplement the nutrients that your body needs, and therefore, vitamin D as well. The special thing about this is that if your body doesn’t feel good, you won’t absorb these nutrients! I wrote about this in article 27, “Production Resumes”. Your cells open themselves up and allow nutrients in again! 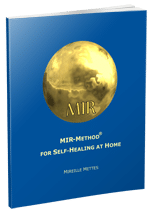 With the other MIR-Method steps you are giving your cells the message, “I want to be healthy and will get rid of everything standing in the way of health.” Whether that is by detaching yourself from your parents (step 3), clearing your meridians (step 4), fulfilling basic needs (step 7) or optimizing chakras and aura (step 8), nutrients will become increasingly better absorbed by your cells. Step 9 sends you outside! The best phenomenon is when people start living their missions again (step 9). If people do the MIR-Method, they feel more like going outside…. And into the sunlight! With a dose of sunlight, your body is happy and your cells do a happy jig 🙂 We have to give our bodies the nutrients they need, such as fatty fish once in a while, animal foods if you can and most importantly, often in the sun! Not long, but often. A half an hour a day is enough. Then you don’t need to use sunscreen. You only use it when you are outside all day, although I prefer to wear long sleeves and use a hat. And what about you? Have you noticed that you get outside more often and soak up the sunlight? I’d love to hear about it and also whether you feel less depressed. Please let me know about it below. Thank you! Wishing you much sunshine in your life! I was introduced to the MIR method a couple of weeks ago from my laughing yoga class teacher and somehow this clicked for me right away. I felt more love for myself just by stroking. Now that I am in the fourth week, I have noticed so many changes its amazing… first with the yawning, later with coughing, some crying for old hidden issues. Two days ago I even put in the Smoking Addiction command in front of the nine steps and guess what I go out to nature when I walk my dog twice a day and I sing the steps… hahaha.. this is soo much fun.. One thing also I noticed is tha my skin looks terrific. it was dry and soo tired before… I look so much better!!! I sleep like a baby and I am making decisions where noone could have moved me from my situation before (soon to move to another country with a new job and all). Well let me say how much I appreciate you and what you have created for us. Its a gem!!! With my love and respect!!! How wonderful that you notice so many great changes in your body and life! I am happy for you! And thank your yoga teacher for me! Hope you can tell many people around you to give it a try as well! Good luck in your new job and new country! Thank you for your kind words and I am very happy the MIR-Method feels good for you! Thank you for your kind words about the article. Am glad you liked it. Hope you will find some nice sunshine! Hi mirielle, you say about getting out in the sunshine and soaking up the Ray 🙂 I know it’s lovely . But why do I have brown discoloured marks on my face caused by the sun ( I do take meds for HBP though) but I do love your information M.
Could the discoloured marks come from being overly sensitive because of the medication? I don’t know, am just asking. Very often meds don’t go well with sunshine. Have you asked your doctor about this? But not to worry, ususally the MIR-Method helps with side effects of medication. I wish you a very,very good new year! Ines de Jongh-Vargas from Argentina. I was singing ‘Don’t cry for me, Argentina, this weekend. Funny! 😉 Greetings back from the Netherlands!